The Kettering Bug was an aerial torpedo, the forerunner of what today is considered a UAV or a cruise missile. It was capable of striking ground targets up to 75 miles (120 km) from its launch point. During World War I, the United States Army aircraft board asked Charles Kettering of Dayton, Ohio to design an unmanned "flying bomb" which could hit a target at a range of 50 miles (80 km). 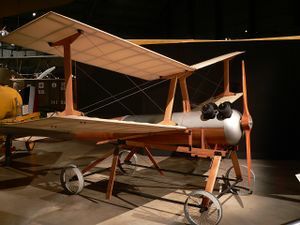 Kettering's design, formally called the Kettering Aerial Torpedo but later known as the Kettering Bug, was built by the Dayton-Wright Airplane Company. Orville Wright acted as an aeronautical consultant on the project, while Elmer Ambrose Sperry designed the control and guidance system. Basic specifications of this relatively small, unmanned biplane included a wingspan of 15 ft (4.5 m), a length of 12.5 ft (3.8 m), and a height of 7.7 ft (2.3 m). The aircraft was powered by one 40-horsepower De Palma engine. The fuselage was constructed of wood laminates and papier-mâché. The 530-pound (240 kg) (gross weight) Bug was launched using a dolly-and-track system, similar to the method used by the Wright Brothers when they made their first powered flights in 1903. Once launched, a small onboard gyroscope guided the aircraft to its destination at an air speed of about 120 mph (193 km/h). The control system used a pneumatic/vacuum system, an electric system and an aneroid barometer/altimeter. To ensure the Bug hit its target, a mechanical system was devised that would track the aircraft's distance flown. Before takeoff technicians determined the distance to be travelled relative to the air, taking into account wind speed and direction along the flight path. This was used to calculate the total number of engine revolutions needed for the Bug to reach its destination. When a total revolution counter reached this value a cam dropped down which shut off the engine and retracted the bolts attaching the wings, which fell off. The Bug began a ballistic trajectory into the target; the impact detonated the payload of 180 pounds (81 kg) of explosives. 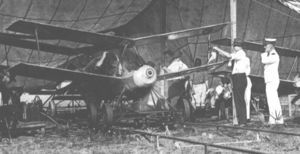 The prototype Bug was completed and delivered to the Aviation Section of the U.S. Army Signal Corps in 1918, near the end of World War I. The first flight on October 2, 1918 was a failure: the plane climbed too steeply after takeoff, stalled and crashed. Subsequent flights were successful, and the aircraft was demonstrated to Army personnel at Dayton. Despite some successes during initial testing, the war ended before the Bug could enter combat. By that time, about 45 Bugs had been produced. The aircraft and its technology remained a secret until World War II. 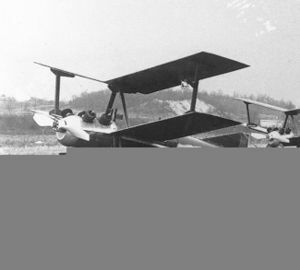 During the 1920s, what was now the U.S. Army Air Service continued to experiment with the aircraft until funding was withdrawn. A full-size reproduction of a Bug is on permanent display at the National Museum of the United States Air Force in Dayton, Ohio. From April 1917 to March 1920 the US Government spent about $275,000 on the Kettering Bug. This page was last edited on 6 March 2007, at 11:10.